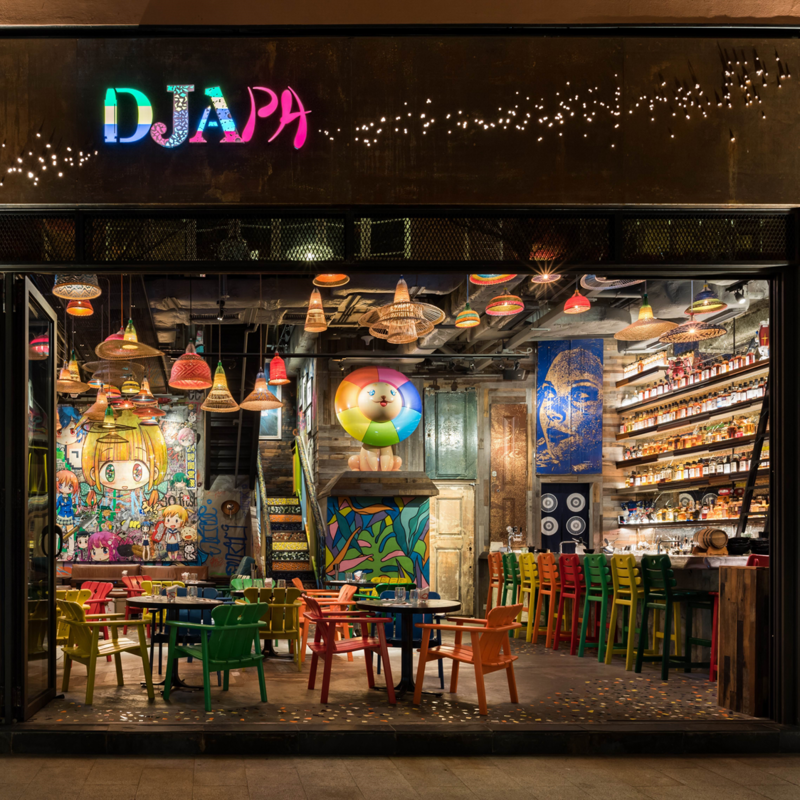 Djapa is a Brazilian-Japanese Bar and Restaurant whose core design theme borrows from the imagery of the Favela: shanty towns that have grown around the major cities of Brazil, where vivid colours and graffiti adorn the raw concrete, steel sheet, timber boarding and block structures from which they are built. Wall are left either unfinished or with spray and hand brush graffiti. Contemporary Japanese art, principally from the anime genre, hangs on either bare or graffiti daubed walls. Sculptural pieces occupy prominent locations on both floors. Floors are mainly unfinished concrete partially inlaid with brightly coloured, smashed ceramic plates and bowls and shards of mirror and, in random patches, recycled parquet flooring. Seating on both floors in a variety of bold paint colours. Sake barrels are used as table stools in the bar area. Table surfaces are of roughly hewn timber and bar tops are of solid Sapele inlaid with bright circles of colour. Open ceilings leave services exposed, with expanded metal mesh through which antique tungsten effect LED lamps provide a warm glow. Track mounted spots illuminate the artwork and pendant lampshades, from recycled straw hats, hover over the tables and bartops. At both levels, windows and fold-back doors, have applied, rust-look patina finishes. The exterior bullet ridden signage board is similarly rusted. An open kitchen on the first floor prepares food for both levels while the Japanese Whisky Bar at ground similarly serves the two via a new dumb waiter.